Contrary to the information on the front cover, these tracks were recorded in 1970.
and Eric Bell and Gary Moore on guitars as well as some other musicians. The recordings were engineered and produced by studio owner John D’Ardis. For more information on Trend Studios and these tracks click. 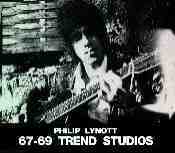 These recordings can also be found on Philip Lynott: A MAN AND HIS MUSIC Volume V and again on Philip Lynott: A MAN AND HIS MUSIC Volume VIII.